AI and voice recognition will drive engagement with customers Indian brands l..
Consumers expect brand experience to be great, and will post their verdict Inspiri.. Conscious consumers influence brands, across categories, to act responsibly In..
Brands must mirror diverse reality of how people live now Consumers respond to.. Insights are critical for brand building, but don’t always cross borders well .. Transformation in rural India Is also in the mind of the consumer Reaching 60..
Fluid identity influences many purchasing decisions New research provides insights into consu.. Rural and urban Indians share similar aspirations Brands can benefit from change and hel..
Indian national pride influences brand opportunities, challenges Trend shapes consumer e.. Brand ambassadors now more relatable Indian marketers traditionally have relied on major..
Online spending rises rapidly, led by travel Phones and technology drive retail sales ..
Modern retail and e-commerce grow, but shops predominate Indian retail is distinctive. It tra..
Media spending rise highest in five years India is the fastest-growing major ad market &..
More consumers consider environment when buying But most focus on immediate concerns &nb..
Premiumization Indian consumers will pay more for benefits Brand strategies make premium..
More Indian consumers now buy on promotion Indians are shopping on promotion. This recent dev..
Indians choose brands based on quality, convenience, price But as choice increases, loya.. Brand Building Action Points The Indian Consumer and Shopping Habits 1. Be clear about ..
Creative problem solving can help brands improve products, services Several In..
Consumers will make mobile devices their key TV screens Brands need to supply .. Brand challenge: Reach the right consumer group at the right time And be authentic .. Innovative tech opens fast-growing, non-urban markets to brand builders Smart ..
As Indian culture evolves, brands can help shape positive change Empower and ..
For emerging India brands 1. Connect emotionally To connect emotionally is important for any brand,.. This section about emerging entrepreneurial Indian brands inaugurates a new feature of the BrandZ&tr..
As India experiences rapid economic growth and the possibilities of modern life meet the pull of tra.. Global ideas, reinterpreted, meet local consumer needs A new phenomenon – the eme..
People moving into urban middle class will drive growth over next decade Brands ca..
Higher consumer expectations make sustaining brand trust more difficult But tr.. 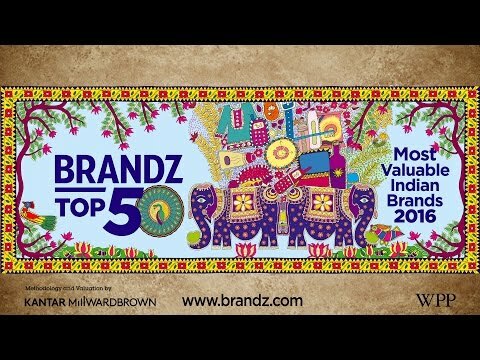 Visual language now is critical for impactful brand stories Global trend fits well ..
India’s Brand Contribution leaders consistent over time Maintain strong impressions in ..
Five critical steps for building valuable brands in India To grow in any country ma..
Four brands enter the India Top 50 for the first time They reflect increasing consumer ..
Internet Use Expands Rapidly Both In Urban And Rural India Mobile becomes the access point ..
INTRODUCTION The brands that appear in this report are the most valuable in India. They were..
As India’s economy becomes more open, so does the society, and attitudes change ..
We help build valuable brands Our WPP companies have been engaged in India for more th..
Strong valuable brands deliver superior shareholder return BrandZ™ India Top 50 Po..
Category composition becomes more diverse Airlines enter the BrandZ™ India Top 50.. Rising income, availability of brands influences consumer buying behavior Digital leads ..